4 bedrooms, large kitchen and sitting rooms in a characterful house. Traditional style house, probably around 200 years old with lots of character, but has gas central heating etc. Downstairs there is a large, fully equipped kitchen, back kitchen with shower and wc, and huge sitting room with sofas, dining table, log burner. Plenty of space to watch TV, read or just relax. Upstairs there is a further sitting room (with a double day bed), 4 bedrooms with double beds and some with singles too (will sleep 8 people easily) and bathroom with shower/bath. Outside the private garden is mainly gravel or patio, with an outdoor bbq area, parking for several cars. The whole area is walled and approached through a drive through gate. The garden has various plants and is big enough to find sun or shade whenever you need it (except at night of course!). I work at the NSPCC and live in West Sussex. My sister lives in Tusson (about 5 minutes' walk from my house). We go to Tusson as often as we can (5 of us including a toddler). When looking at houses to buy, this one stood out: it is quite large by UK standards, the sitting room is very big and so are the rest of the rooms, and there are some very nice original features like the stone floor in the kitchen, staircase etc. The garden area is fully enclosed and private. It is big enough to relax in and there is an outdoor kitchen and patio area for outdoor cooking and eating. The house is at the heart of the village, which has many fine old buildings. The village has all that you need (restaurant, shop, post office, bar and an art gallery) and close by is Aigre, which is has all the amenities of a town or Ruffec, which is a regional centre. Not far away is Angouleme, which is a medieval walled city and has lots to offer. There is always something happening, fetes/markets etc. and plenty of places to go and it is quite easy to find out more about them. Alternatively, the village of Tusson and surrounding countryside and forest/woods are great for walking. Gas central heating and hot water on demand. Parking in the paved area of the courtyard for several cars. Car port for 2 vehicles. The sitting room is large. It has 3 sofas, armchairs, tv, wood burner, dining table and beams. There is a dining table in the kitchen which seats 6/8. There is a dining table in the sitting room which can seat 6/8. There are plenty of chairs. Picks up main uk channels. Fairly modern flat screen with connections for laptop etc. There is plenty of outdoor space, including a paved area with table and chairs for eating, especially nice for dinner. Bikes are not kept at the house, but I can arrange them if required. Tusson is in the heart of the Charente, equivalent distant between Poitiers and Angouleme. The house is at the centre of the village, which is renowned as an historic centre. As such, it is good to walk around - there's lots to see - or use this as a base to explore the area. 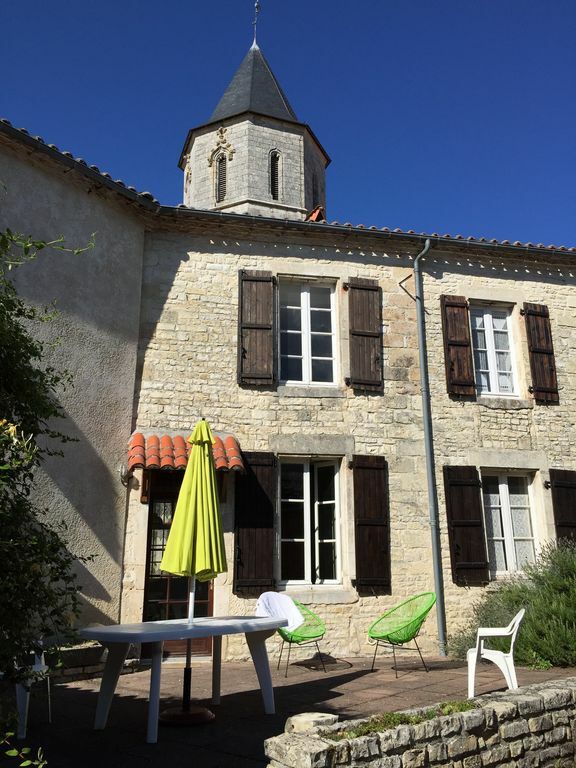 Typical French House full of character in a rural village steeped in history and beauty. We were a family of eight spanning four generations and the house fitted us perfectly for our two week stay. There was plenty of outside space for the smallest to play and the older ones to relax and enjoy. Inside was no less generous on space and comfort with plenty of seating in the lounge for everyone. The bedrooms too were great sizes with comfy beds and space to store clothing etc. Kitchen was well equipped with everything needed. We absolutely loved the house and the area finding plenty of activity for all ages without the need to travel too far. Gets five stars from us as the fit was as good as it gets!! I am really glad that you all enjoyed your stay and that there was lots to do in and around Tusson. There is plenty to do in and around Tusson and the Charente region. There is the plan d'eau des trois fontaines just outside the village (10 minutes in the car). Spring fed, locals go there. Also, the regellant on the Charente close by where there is swimming and other activities. (Canoeing is good fun.) A little further afield is the water park at Angouleme. Haven't been but know people that have said it is very good, especially for youngsters. I have posted some links. I have been to the Vallee des Singes, which is a great day out, there's also Futuroscope near Poitiers, as well as the aquarium and museum at La Rochelle, which is well worth a visit and has loads of stuff for young people. Angouleme is not far away and is well worth a visit. It is a medieval walled city, with loads of murals, street cafes etc. and there are lots of other things to see and do. As I mention on my site, my sister lives locally and can probably give more places to go if you would like.